Pure vanilla extract prices are on the rise. Here's how to make your own at a fraction of the cost, so you can enjoy the real stuff, without suffering sticker shock every time you run out. Pure vanilla extract really is better than the imitation stuff. While most people probably won't be able to detect the difference in your baked goods, seasoned bakers sure will. So, if you care about getting your recipes just right, it's a good idea to upgrade to the real deal. This recipe makes about eight ounces of pure vanilla extract. Any regular baker knows that this can last a very long time—even years—because, quite often, only a teaspoon or two are used at a time. That means that a single batch of extract could make up to 48 cakes! Preparing the vanilla extract is very easy, and should take just about five minutes of hands-on time. The only drawback is that you need to allow about two months for the extract to fully develop (though longer is even better). So, while it's easy to make, it sure isn't quick. Be sure to plan accordingly -- especially if you plan to use your vanilla extract for gifts. Use a knife to split the vanilla beans open lengthwise, stopping one inch from the end of each bean. Place the cut beans in a glass container, and cover them with vodka. Make sure the beans are completely submerged; push down any that aren't. Secure the lid, and store in a cool, dark place. Allow the extract to develop for at least two months before using it. Shake the bottle at least once a week to distribute the flavor evenly through the vodka. To replenish your supply of extract, just add more vodka to the bottle. The original beans can be reused several times, before you'll need to buy more. You'll know it's time for a replacement, when your extract is no longer developing that customary dark brown color. Homemade vanilla extract makes a great gift. Package some up in small brown bottles, and decorate them with your own label. 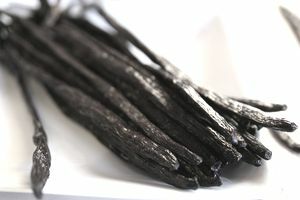 Online vendors tend to have the best price for vanilla beans, and you can often find them for $3 per bean or less. If you go to your local grocery store, you might pay three times as much for a single bean! Want to make vanilla without the alcohol? Not a problem! All you need is vegetable glycerin and a few tips. Why Is Pure Vanilla Extract So Expensive? The simple answer is that vanilla beans themselves are expensive. The price of real vanilla extract is reflected in the cost of the beans used to make it. The average cost for pure vanilla extract is around $20 for an eight-ounce bottle, and the really good stuff can run even higher. Compare that to $6-7 for the same amount of imitation vanilla, and you can see why frugal bakers often turn to the cheaper stuff. How Much Does Homemade Vanilla Extract Cost? Savvy shoppers will find deals on the vodka and vanilla beans needed to make their own vanilla extract. The cost savings is significant, especially considering the beans can be reused multiple times. Reuse your beans to make additional batches, and your cost will go down to just $3.36 for eight ounces! Vanilla extract has always been expensive because it's so labor-intense to grow. Each vanilla orchid has to be hand-pollinated, and this can only be done one day a year (during a 12-hour window of time). In recent years, vanilla bean prices have shot up drastically. This problem started when farmers began to move away from vanilla production (demand was down and it just took too long to produce), and it was made far worse when a Cyclone hit Madagascar (the chief producer of vanilla beans). As the natural foods movement continues to gain steam, there simply isn't enough vanilla to keep up with demand, and since it takes three years for vanilla orchids to start producing beans, this problem isn't going away any time soon. Working on a recipe, and just need a quick stand in for the vanilla that's called for? Try this substitute.